So, after a bizarre process of leaks since Sunday, Uber has confirmed Dara Khosrowshahi as the new chief executive. New leadership at Uber gives the company the opportunity to change its ‘toxic culture’, but it is the underlying governance and ownership that needs reform. In the case of Barclays, Antony Jenkins, was hired as CEO to clean up the culture after record fines for misbehaviour. Within a short period, the Board’s priorities changed, he was moved on and new fines emerged for new misbehaviours. The lesson, as I have noted before, is that corporate executives change faster than corporate values. In a company where ultimate control lies with the investors, when disputes arise or crisis comes, there is a need for owners to signal what values matter in how the business is run. In a digital platform such as Uber, the drivers are not owners, as they might be in a co-operative, but they also are key to the values of the business. Their participation shapes customer experience over time and the sustainability of the commercial offer. The current governance structure of Uber, in line with other Silicon Valley start-ups, is flawed, not just because many investors are not true owners in terms of rights of control, but also because it gives no voice to the drivers that are ‘partners’ in name only. The old saying is that business does not have a culture. It is a culture. A new CEO for Uber is a start, but the more radical decisions lie ahead. I have an uplifting set of figures land today from the ethical investment network, Oikocredit International, which operates out of offices in 31 countries worldwide. Here in the UK, we are proud to have Oikocredit as a co-operative member and support its work to attract individual and institutional investors. The organisation now finances a €1 billion portfolio of enterprises in low-income countries with a development focus, including many formal co-operatives. Around forty million people, 84% of whom are women, participate in the ventures that Oikocredit helps to finance. There is a healthy representation of fair-trade ventures in their lending, 85 over the year 2016, as well as a wider range of co-operatives, 2014 over the same period. Around half of the lending (48%) is rural, with just over a quarter (27%) focused on farming. Oikocredit is one of a growing number of co-operatives and wider businesses that measure their performance against the United Nations Sustainable Development Goals. In line with this, the International Co-operative Alliance has been running a support programme to encourage the link – Co-ops for 2030, linking to the target date for the completion of the goals. Many years ago, the pioneering sustainability author Hazel Henderson described work like this to me as ‘the arrival of global citizens, in advance of the structures of global governance’. One answer to the challenges of international co-operation is to build co-operative institutions that can pave the way to a fairer world. With forty million people in its reach, Oiokcredit and its investors, many of them faith-based, are making a start on that path. It is common to contrast those who want to interpret the world and those who want to change it. Karl Marx had a formulation to that same effect. Modern economics can claim to do both. Economic interpretation is powerful because people so often accept its claims and act on its prescriptions. But what if the influence that economics typically has is simply to arrange matters so as to fit more closely its pre-ordained interpretation? There are plenty of examples of economic policy that assumes text book solutions and, for better or for worse, is pushed and pushed, despite reverses, until the reality comes closer to what the text book describes. When we use the word ‘market’, we use a metaphor for interpretation that is extraordinarily plastic. True markets, for the sale of produce in urban settlements, pre-date modern economists by thousands of years, but the reality of most markets today bear no relation to those original local markets, nor are they a good approximation of the economic text books. So, what happens if pushing the text book model changes things for the worse? Well, then the text books would need to change for a start. This is part of the work of Professor Samuel Bowles who works at the Santa Fe Institute, leading a programme of work on behavioural sciences. With CORE (Curriculum Open-access Resources for Economics), an international collaboration of economists, he is currently developing a new curriculum for undergraduate economics. Bowles is a brilliant thinker, whose work crosses boundaries across academic disciplines. His last book, A Co-operative Species: human reciprocity and its evolution, written with Herb Gintis, combined modelling, archaeology and evolution in order to re-tell the biggest story of all, the story of humanity. I reviewed the book on this blog some years ago. 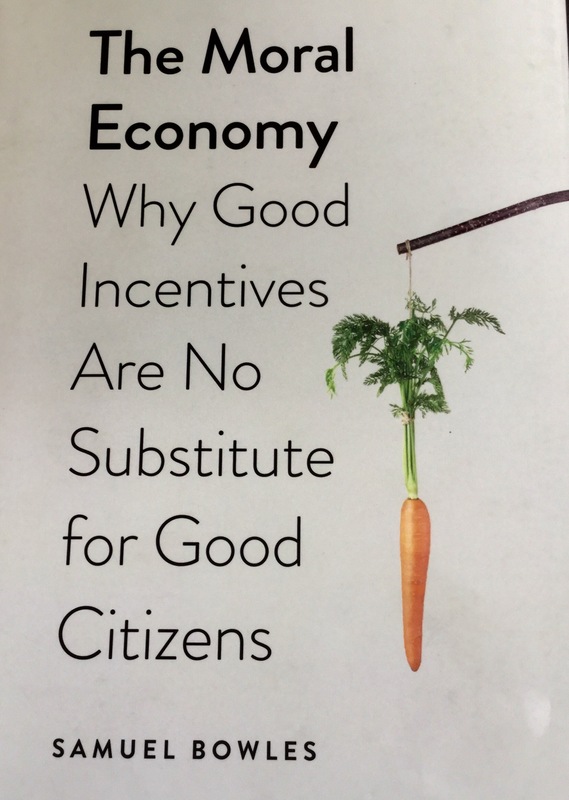 The subtitle of his latest book, The Moral Economy, summarises the argument of the chapters that follow, each based on a lecture he gave at Yale, in nine short words: why good incentives are no substitute for good citizens. The idea that people respond to financial incentives is core to modern economics. By and large, if there is an opportunity to do so, economic policy argues that you should introduce financial incentives where there were none, and the outcomes will be better. In recent years, the profession has been active in qualifying those assumptions and exploring new tools for a new economics. When we respond, we don’t necessarily do so entirely rationally is the lesson from the field of behavioural economics. When we overshoot the critical carrying capacity of nature, scale rather than efficiency alone defines what will give better outcomes is the lesson from the field of ecological economics. The field of experimental economics is one that has used the tool of game theory to understand how people are likely to behave in practice. What emerges from games such as the Ultimatum Game, tested around the world, is evidence that people will often act in ways that are co-operative rather than purely self-regarding. The reason is not down to incentives, but to values. Sam Bowles is a pioneer in this field and the book tells the story of what happens if people are assumed to be self-interested, incentives driven. All too often, they become self-interested and incentives driven, because that is the signal they are given. That process works where markets work, for example where contracts are complete and there are no big spillover effects (externalities). But it can fail to work, and work to create damage, where this is not the case. Introducing financial incentives can ‘crowd out’ social norms. So for example, if you pay children to read books, they are less likely to sustain reading over time, when payments stop. If you pay them to draw pictures, the artwork is of lower quality. If you pay people to recycle, you can reduce the propensity of people to recycle without payment. The signal at work is that because there is payment, the behaviour of others is seen as instrumental and self interested. On the time-honoured principle of ‘I will if you will’ we are then less likely to act simply because we feel it is the right thing to do. Bowles points to other examples of the same effect. Putting explicit conditions into a contract to cover breaches of the contract, for example, increases the likelihood of a breach. Bowles cites the case of the Boston Fire Commissioner who was suspicious of firemen calling off sick and threatened to dock the pay of anyone off sick for more than fifteen days. The result was a spike in sickness, with a tenfold increase in firemen calling in sick on Christmas and New Years Day. The Commissioner in effect signalled that what he focused on was contract and enforcement. What was set aside was trust and values. Goodwill went out of the window. The most celebrated case perhaps of payments ‘crowding out’ values was raised decades ago by the LSE Professor Richard Titmuss – the effect of paying for blood donations when it had been voluntary: the result in short was worse all round, higher costs, less blood collected. The contemporary Titmuss Professor at the LSE, Julian LeGrand, reached a slightly different view. He had a go at modelling the effect of crowding out in his 2006 book Motivation, Agency, and Public Policy: Of Knights and Knaves, Pawns and Queens. His view in short was that if you could sustain payments at high enough of a level, then financial incentives could pay off through efficiency gains. As a result, he argued for the extension of policies such as competition between providers in education and health services. He did not at the time have access to the kind of behavioural models that Bowles sets out. And what he did not address directly was the potential downsides on social norms over time that might support children’s wellbeing or patients’ health. As ever, it is easy to assume that values are just fixed and unchangeable – like nature, always there, always to be drawn down. In reality, the right values can become over time as scarce as nature can be overstressed. Rather than crowding out people’s values, is it possible to find ways to ‘crowd in’ those same values? Throughout his book, Bowles is interested in questions like this of governance… how should society be organised? Where can collective action make a positive difference? An example is the effect of everyday institutions. Bowles cites public good experiments in Japan and Brazil which showed that those who contribute more are more likely to be members of fishing co-operatives. In part this is the influence of social norms, remembering both that people tend to align with how others around them behave, and that co-operation can breed co-operation. Markets are not necessarily bad for values. Honesty can be a key to a commercial moral syndrome, as Jane Jacobs argued. Business leaders in Costa Rica were more likely to be generous than economics students in the USA. That probably says more about Costa Rica though than it does about CEOs worldwide. The writers of the best-selling Freakonomics series are champions of the idea that incentives have a powerful effect across society. Their response to the kind of evidence that Bowles and others set out is to suggest that anything that motivates people beyond money can also be embraced as ‘non-financial incentives’. But this simply extends the metaphor – it doesn’t help us get closer to a more realistic account of human behaviour. If you simply want to change the world, without taking the trouble to interpret it, you are in the realm of guesswork and ideology. That is where conventional economics has been for some time, so caught up in its own measures of success that it has failed to question whether if the assumptions are wrong, the measures of success might be no less flawed. The good news for the interpreters, is that the world is more open to engaging on the basis of values than economics has led us to believe. Data from a wide range of behavioural experiments suggest that twice as many subjects exhibit co-operative choices (meaning that they returned favours even when not doing so would give them higher payoffs) as self-regarding choices. A moral economy doesn’t have to reinvent people’s values, but affirm them. There is a compelling case to change the world… but to do so, we should also look at how we interpret the world, to understand what it is we need to conserve. That way lies the moral economy. I am in Walthamstow for the launch of the latest outlet for the fast-growing freelancer co-operative, IndyCube, working with the support of the union Community. With wonderful symbolism, the setting is a former Co-operative Bank on Hoe Street. Through the Hive programme, the Co-operative Bank as part of its ongoing Ethical Policy, has been directly supportive of a new generation of co-operatives, such as freelancer co-ops. 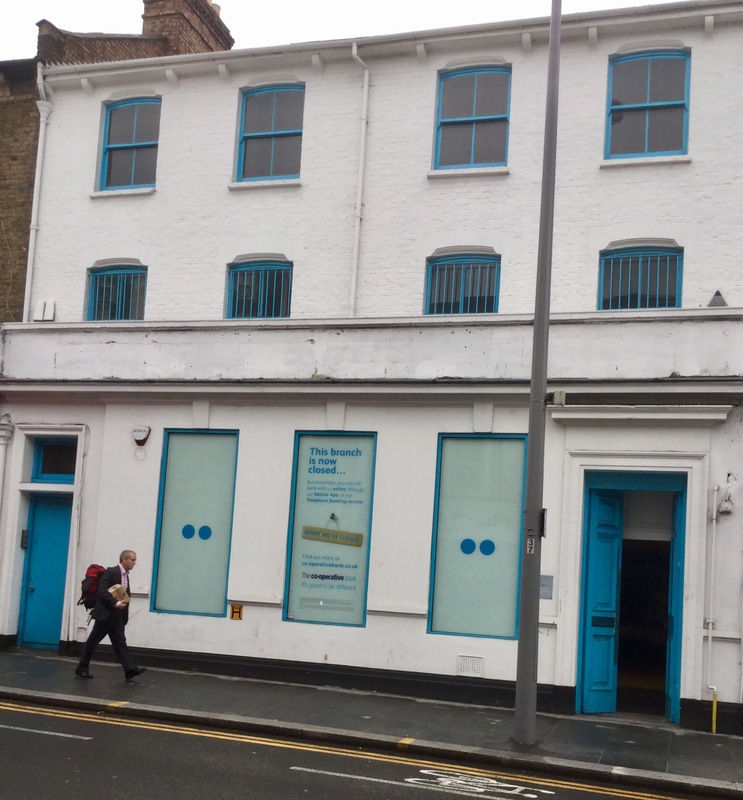 We are likely to see local events or support from the Hive perhaps now delivered via this setting in East London. The rise of freelancer co-operatives is being seen here in the UK – and we have a welcome new guide to the field due out this Autumn in partnership with the TUC and Co-operative College – but also in other countries. In South Korea, after the Framework Act on Cooperatives took effect in December 2012, a swathe of new freelancer co-operatives have been formed. During the first 30 months after the FAC took effect, Koreans founded 7,132 cooperatives, of which more than 74 percent are small entrepreneur cooperatives, including cooperatives established by self-employed individuals with employees, self-employed individuals without employees, and freelancers. Started as a mutual of artists, the emergence of SMART in a range of countries across Europe to serve freelancers is one of the poster children for an emerging new model. Alex Bird, co-author of Not Alone, a landmark report for Co-operatives UK that helped to inspire IndyCube today, tells the story of SMART as a case study and there is one chapter which I found inspiring when I first heard about it. This was how the co-operative’s biggest single financial loss turned into its biggest marketing success. As part of their growth in Belgium and France, SMART recruited hundreds of “Take Eat Easy” cycle couriers. SMART were involved in negotiations with the company, and helped secure an agreement for their members to pay the couriers per shift, rather than per delivery. In July 2016, disaster. “Take Eat Easy” went into bankruptcy – partly as a result of competition from Deliveroo. Living up to its guarantee, SMART paid out to its members. The business lost the huge sum for it of €340,000. But it turned out to be the best recruitment tool that it had ever experienced. The members told everyone about the co-operative and how it had stood by them. Nothing else on the market matched this offer from SMART and freelancers flocked to join, for the assurance membership offered and having had the proof point of the collapse of “Take Eat Easy” that the co-operative was on their side. Despite the shock and crisis, this was a good news story for SMART. It was a financial shock, but one that it was able to weather, having built adequate reserves in a guarantee fund over time. Every penny spent on the guarantee for cycle couriers who lost out was recouped in new membership fees over the period that followed. Losing money turned out to be the biggest boost this enterprise could have. Small is beautiful, but it is not secure. Small becomes powerful when it comes together.